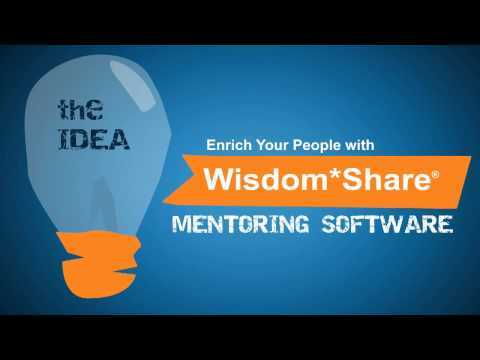 Wisdom Share mentoring software promises an online solution that encourages companies and organizations of all kinds to share knowledge and expertise within a workforce. The system offers a proprietary matching algorithm that analyzes a talent pool and applies 18 compatibility factors to place mentors with mentees more effectively. Pairing people more successfully based on proprietary personality assessments, Wisdom Share also assist the process with guided participant roadmaps. Customizable goal-based milestone calendars inform progress, issuing email notifications on achievement deadlines and tracking development data. Managers and HR directors can then keep up with key mentoring metrics with analytical tools including dashboard-based reporting, feedback surveying and more. Such reporting features claim to provide a greater visibility into the effectiveness of a mentoring program by better highlighting action-oriented achievements all linked directly to participant goals. Wisdom Share also supports mentoring communications with messaging functionality for not just chatting but also sharing files or resources, while social tools inspire discussions and the publicizing of gamification features such as badges. Schedule a demo and request pricing information via the Wisdom Share website. Wisdom Share offers an online mentoring software solution for businesses, educational facilities, government agencies and non-profit organizations that supports staff development by fostering a goal-based mentoring program wholly customizable to meet required objectives. The product claims to feature one of the most accurate matching algorithms available, leveraging 18 compatibility factors and supposedly capable of stimulating higher levels of engagement between users with 99% satisfaction ratings. Pairing mentoring partners so carefully and accurately is known to launch a more successful relationship from the off with quick, engaged communication lines and a greater sense of trust. Guide participants with milestone calendars and email alerting while tracking progress and promoting active discussion with facilities for messaging between partners, sharing files and more. Beyond the provision of an online training library of best practice resources, managers and mentors can monitor key metrics with dashboard-based summary reports and gauge performance feedback from conducting surveys. Below are some frequently asked questions for Wisdom Share. Q. What type of pricing plans does Wisdom Share offer? Q. Who are the typical users of Wisdom Share? Q. What languages does Wisdom Share support? Q. Does Wisdom Share support mobile devices? Q. Does Wisdom Share offer an API? No, Wisdom Share does not have an API available. Q. What other apps does Wisdom Share integrate with? Q. What level of support does Wisdom Share offer?